We have all had life-changing experiences and encounters. They can change our perceptions, even if just for a moment, and show us that reality is not what we have been made to believe, that there are mysterious cracks in the supposedly holistic theatre of our lives. This kind of change of perception has happened to me several times – most notably last week. It was a day no different from any other. I took a train to the city, then changed to a tram; both were crowded on a cold Melbourne day (winter in Oz). Nothing unusual so far. Everyone was in their seat absorbed in checking messages on their mobiles, not looking at each other, but the atmosphere was generally friendly. Normal. Then I got off the tram two stops earlier than necessary to have a bit of a walk, even though the day was cold and windy. My perception, by some act of Divine Grace, changed. I saw, with my earthly eyes, the eyes I use every day, the theatre of our lives. This was a completely artificial setting, a theatrical stage, as the Vedantic philosophers call it, or Maya. I saw the Illusion. For a brief moment I was outside of it, as if I were in a film but the frame in which I was captured was stopped while the rest of the film continued. People were going to work, running around on this windy day doing their business at the centre of a big city. Their movements were automatic and predictable. We were the moving parts of a Machine. That Machine normally included me also, but for that moment I was liberated, I had a clear vision. I saw it for it was – an artificial superimposition on our reality. I held this vision for as long as I could so as not to forget it. I knew it was an important, if also staggering, experience. I had to remember it because remembering it would change everything. Now this would have been a horrendous experience if I had not had an opposite one in the past. I underwent the exact opposite experience of reality after my first Shaktipat. Shaktipat is a ritual for the awakening of the Kundalini Energy, the sacred energy that lies coiled down at the bottom of our spines. She is the unawakened potential within us. Once awoken, the Tantric and Kundalini traditions believe, the energy changes our perception of reality, speeds up our spiritual evolution, and leads us on the path of liberation and awakening. My Shaktipat was dramatic. 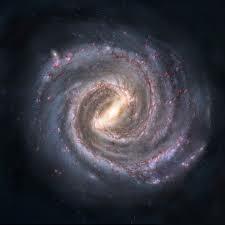 I saw space curving as it was the toy of some quantum physicist, firstly expanding the room to enormous proportions, then shrinking it back to subnormal size. I began sobbing, then laughing. In case you’re wondering, no, I had not taken anything prior to this. In fact, I have never taken anything that even vaguely resembles drugs. For the next three months I was in a state of complete ecstasy, feeling but a particle in divine creation, at one with everything, separate from nothing. That lasted for about three months until I fell back down into the matrix of normality. How can these two drastically different perceptions of reality occur for the same person, albeit several years apart from each other, you may ask? The answer may lie in the Gospel of Thomas. Yeshua (Jesus’ name in Arameic, his first language) says, ‘If the doors of our perception were cleansed, we would see everything as it is – infinite.’ This quote has been repeated in various forms by William Blake, Aldous Huxley, Joseph Campbell and others. So the question is: who or what dirties the doors of our perception? The Gnostics believe it is malevolent, immaterial beings pretending to be gods. They enslave us with unnatural working hours (9 to 5), bureaucratic and inhuman institutions, our own fears and desires to get ahead, and by structuring society in such a way so that whatever you do you can never be free. 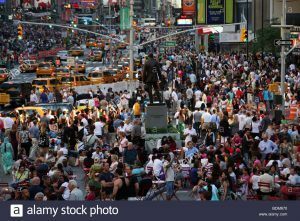 It’s nothing personal, Neil Kramer, a British-American esoteric philosopher says, they just need to keep us in fear so they can feed off our low energies. Another, perhaps more plausible, explanation is that we ourselves have created the Machine. This is a creation of Yang without Yin, of the masculine left brain without the feminine right brain. It is a world without the wisdom of the Divine Feminine, which we have all nearly lost, both women and men. Another questions then appears: What do we do with this kind of experiences afterwards? Do we just rejoin our not-so-coherent reality or do we move past it? We can either buy into the Machine and run around and climb the ladder of affluence, career, dramatic relationships, fame, money or whatever one’s inner drug is. If we choose to do that it is good to remember that there is a price to pay for it – We will live lives designed by someone else and we will be pawns in someone else’s Game. That is why we experience a mid-life crises – a great opportunity to wake up that what the society told us is not exactly the whole story. At that stage, we often feel profoundly wounded and used. For example, although getting married, having kids and getting a mortgage can be fulfilling for some it is not the only and necessarily the most fulfilling way to be for the most. Indeed, ‘gage’ of ’mortgage’ means ‘offering something of value in exchange’ while ‘mort’ means ‘death’. So in good cheer we can ask ourselves whether we offer our life in exchange for ‘mort’? OR we can use the Game to our own worthy goals. Eckhart Tolle says that often awaken people carry on small businesses or have part-time undemanding jobs so they can live a contemplative life or a life of a higher purpose separate from the expectations of the Machine. Either way, as all spiritual teachers worthy of that name will tell us, we can use the experience for our liberation from the Machine. You can use it for your spiritual evolution. Once we see the Machine, we can’t treat it seriously anymore. Gratefully, the Divine Narrative is such that in every scenario there must be liberation. Every liberation starts with the vision or experience of another possibility. 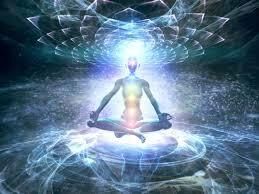 This other glorious and truly divine possibility was the vision of oneness I received after my Shaktipat. And as with every liberation story, there is a helper. The helper is the same being who is capable of awakening within us so we can awaken Her within our world. In Tantra and the philosophy known as Kashmir Shaivism, she is called Kundalini or Shakti. 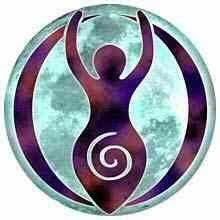 Now, Shakti-Kundalini is the all-encompassing female aspect of Divinity. She is more than a mythic goddess. She is the primal force of all creation, She is the intelligent, sentient pulse of the Universe. She is present in all your creations. She is what a French philosopher Henri Bergson called the elan vital – the Life Force Herself. Without Her, even gods are powerless to create. She is imbued with Life and Energy. Indeed, she is the Creative Energy Herself. More than that, she is the underlying reality of everything. Whether we ourselves dirty our own doors of perception or whether this is done by mean spirits which the Tibetan Buddhists call ‘hungry ghosts’ and the Gnostics archons, once we cleanse our perceptions we see the innate possibility of our lives and the world in which we live. We can see beyond the Machine. Actually, Shakti is not that different from the Great Goddess that some women scholars describe. For them, the Cosmic Goddess represents the ‘great matrix of potential’ in which all forms abide – ‘an infinite ocean of creation’. For example, J A Kent in The Goddess and the Shaman says in Celtic tradition that the Goddess is the Elphame – ‘a foundation of subtle reality’ – where the real and creative dreams cross paths. This reality is not easily accessed if we are completely entrapped within the Machine. Well, women writers and scholars of the Goddess see Nature and Earth as Her Body and say She communicates with us through dreams, visions, shamanic rituals, chanting, or the methods I use – meditation, reading esoteric text and spending time in nature. 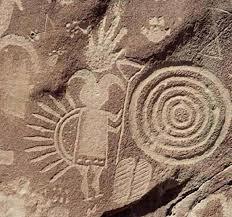 The Goddess scholars would argue that She gives us signs in drawings of the Cosmic Spiral of galaxies left in the caves of Indigenous people, in the repeating patterns of that same spiral in Her own body – in water and shells – and even in the crop circles the mainstream media so vehemently wants us to believe are a hoax. 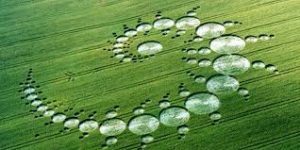 Neil Kramer, that super-lucid philosopher, says it is easy to discern between made-up crop circles and the ones coming from the earth itself. The former are crude and brutal in how they treat nature. The latter form without breaking a single blade of grass, and pulsate with luminescent energy. Just like Shakti, I would say. But even more importantly, that Subtle Energy communicates with us all the time though our intuitions, sudden realisations, insights and even emotions. But do we listen to them? So, just for a moment, if we quiet ourselves and stop running along the concrete streets of the cities, and sit down somewhere in nature, we might just hear Her voice in a bird’s song or see Her in the brunch of an old tree. Just sit for a moment and be open. This entry was posted in Goddess News and tagged Crop Circles, Dr Joanna Kujawa, Franz Kafka, Goddess, Goddess News, Goddesses, Gospel of Thomas, Kundalini, Shaktipat, spiritual blog, Spiritual Detective, The Machine. Bookmark the permalink. Nothing new, really…… depends however, to if the reference is for followers or, for Leaders. This kind of experiences are for those who try to click or, understand the potentiall within. I don’t feel at this point that the crowd you referring are ready or, at this Level of understanding, can appreciate the gravity of the situation. We all students under the Eye of Logos Christos-Mother, any way!!! Loved this one. Thank-you Joanna. It was profound. Thank you Julia. I really appreciate your opinion. This makes it worth it by itself. :). Thank you for your insights – they make me feel less alone. I have had profound experiences – to that made me question my sanity – and one particular one (losing my career) not at all welcome. HOWEVER doing so – it was quite beyond my control – put me on a completely different path to the one I had been following all my life long. I studies myth, legends, Jungian psychology, depth psychology, Ancient wisdom from China – anything that could give me answers. I became a simpler person, gave up all the stuff of normal life, and yes I was able to cope – things worked out and I did not become bankrupt! So I do appreciate your pages, thank you – keep up the great work! Thank you Rosemary. This is really sweet and touches my heart. This is exactly what I wanted to create with this blog: a community of sharing. Being a seeker is seldom easy as there are not that many markers and sign posts on our paths. 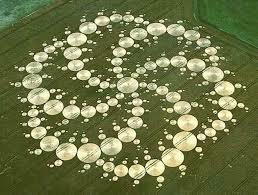 Ad truly, although each path is different, they all have similar shifts. In this way, we can help each other, support each other and share. Three months! Incredible Shaktipat! 😍 A self-realization happened quite casually while I was lounging at home, finally providing an answer to what felt like a lifelong question, “Who am I?”. My analogy is that if we were computers, we would not be the hardware, we are not even the software… but we are the electricity. Then we are all of it, just somehow differently.